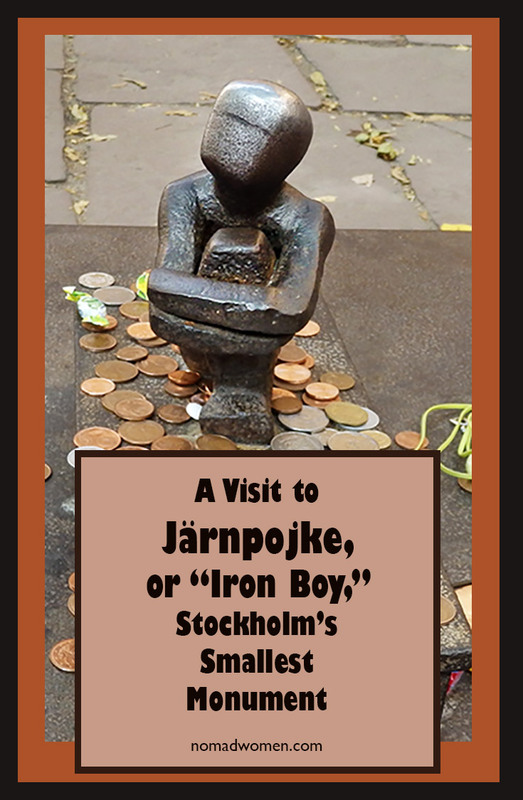 Järnpojke, aka “Iron Boy,” is so small you might miss him. In fact, he’s the smallest monument in all of Sweden. But going in search of him is worth the trip when you’re in Stockholm. And don’t forget to make a wish! Nomad Women will get a small commission. And we thank you for it. There’s someone in Stockholm I want you to meet. He is very small, a little boy. He likes to dress up in hand-knitted scarves and hats in the cold Stockholm winters and sun hats on hot summer days. He enjoys receiving presents and having his head patted. And he loves looking at the moon. Meet Järnpojke, aka Iron Boy or The Boy Who Looks at the Moon. 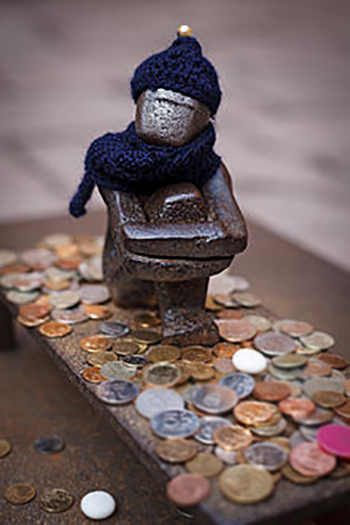 At less than 6″ high, he is Stockholm’s smallest monument. His name is Järnpojke, which translates as “Iron Boy,” because that’s what he’s made of. He’s easy to miss because he’s less than 6 inches/15 cm high. He sits on an iron bench, his legs pulled up and his arms wrapped around his knees, with his face turned toward the sky. That’s why he is also called “The Boy Who Looks at the Moon.” A visit to see him is one of the nicest things to do in Gamla Stan, the city’s Old Town, the most charming and delightful part of Stockholm. As with Copenhagen’s underwater statue of Agnete and the Merman I posted about earlier, most Stockholm guidebooks don’t mention The Iron Boy. Finding him is a bit of a trick, which is why he’s sometimes called a “secret attraction.” His perch sits at one end of a tiny courtyard garden behind the Finnish Church, just a few yards from Stockholm Palace. I don’t think I ever would have stumbled on Järnpojke by myself. I was led there by our guide on an Old Town Walkabout: Guided Tour of Gamla Stan I found through Get Your Guide. The perfect introduction to Stockholm’s Old Town, it showed me things I never would have found on my own. It also gave me a grounding for wandering about solo later on. That’s why I always search out a walking tour when I get to a new city, and this Gamla Stan walking tour was a good one. 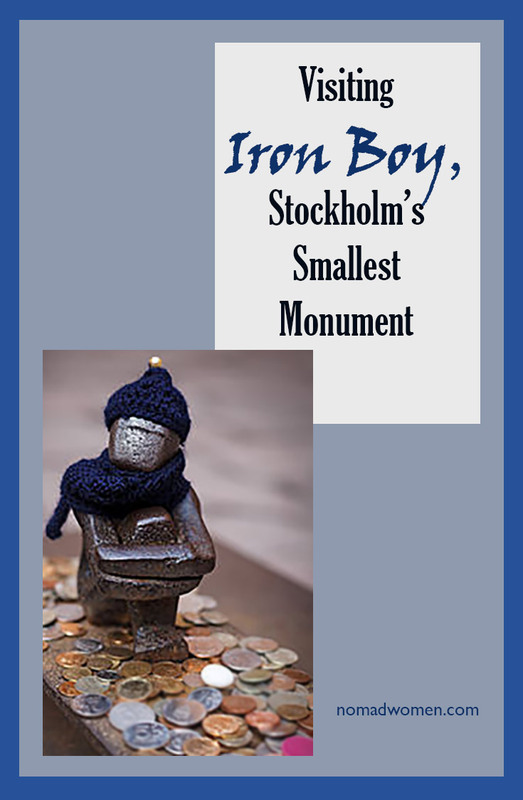 The Iron Boy was first created in 1954 by local artist Liss Eriksson. He was positioned on his little table and placed in the courtyard in 1967. Supposedly, Eriksson had a studio overlooking that courtyard at the time and got tired of how boring his view was. He decided to dress up the space with a piece of art. Also, it’s said that Eriksson, who died in 2000, suffered his whole life from insomnia and spent a lot of time staring at the moon hanging in the night-dark sky. So perhaps “The Boy Who Looks at the Moon” is a bit of a self-portrait. Local people often dress Järnpojke up, especially in the Swedish winters when he’s often seen in hand-knitted hats and scarves. One of the most charming things about Järnpojke is how much this little Iron Boy is loved and cared for by the local people. During the long and cold Swedish winters, he’s often wrapped in tiny hand-knit woolen scarves and a warm knitted cap. In summer, it’s not unusual to find him wearing Barbie-sized sunglasses. On rainy days, he may be protected by a tiny umbrella or wrapped in a plastic poncho to keep him snug. Apparently, he has quite the wardrobe. Very often, flowers, candy, even cheese, fruit, or other snacks and random gifts decorate his table as offerings. The day I was there, someone had left him a lady’s watch and some cookies. Always there are coins from many nations. 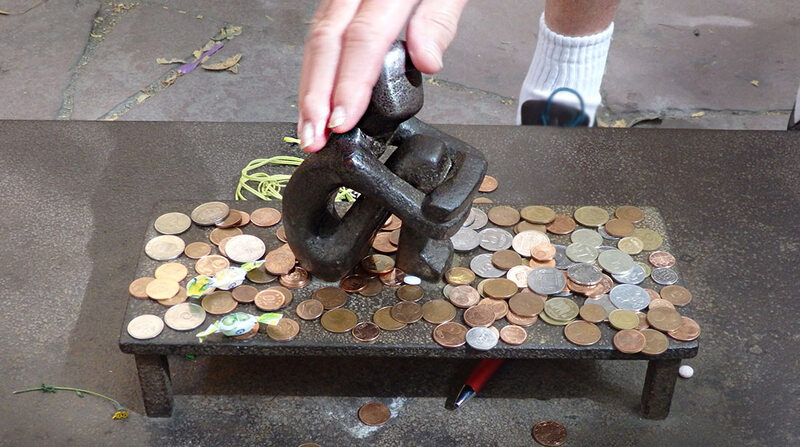 People leave coins as both a thank you and a plea. For the Iron Boy is said to have magical powers that bring good luck. If you pat his little head three times and make a wish, it’s sure to come true within a year. Others say if you pat him, you will return to Stockholm. His forehead gleams from decades of people seeking his blessing. 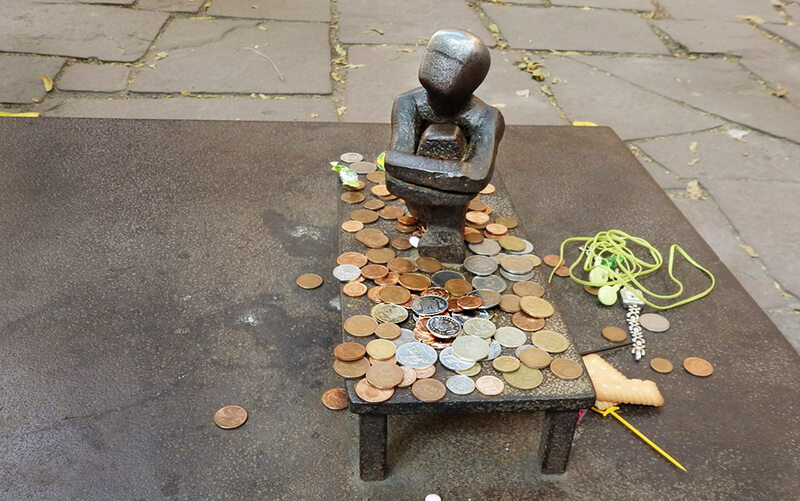 The Finnish church collects the coins surrounding the boy and adds them to a fund to help needy kids in Finland. A Gamla Stan Walking Tour will show you this and many other charms in Stockholm’s Old Town, and I highly recommend booking one. However, if you prefer to venture out to search for Iron Boy on your own, begin at the obelisk in front of the Royal Palace. With your back to the palace, look forward and a bit to your left to the narrow street called Bollhusstäppen and the yellow-orange building of the Finnish Church, the Finska Kyrkan. To the right of the church, walk a few yards/meters up that narrow street to the courtyard in the back of the church on your left. Iron Boy is at the far end of the garden courtyard. You can click on this link to Google Maps to find the exact spot. Järnpojke’s iron head has been worn shiny smooth by decades of beseeching hands patting him for good luck.